Husband, father, Zeide, brother, friend, teacher, Cantor Morris Markowitz was many things to many people, but in his heart he was always a hazzan. Born in Romania in 1924, Cantor Markowitz emigrated to the United States in 1938. As a young man, he was a frequent soloist with the Machtenberg Choir. He went on to study at the Yeshiva and Mesiftah Torah Vadas in New York City. 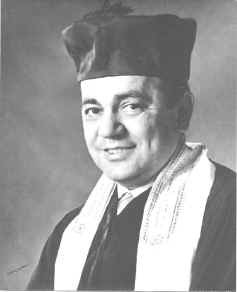 With great distinction, Cantor Markowitz served as hazzan at Ahavas Achim Lubavitz Synagogue in North Buffalo for many years. I'm sure many people remember his incredible voice and terrific sense of humor. He loved his congregants as though they were part of his family. He taught many bar and bat mitzvah students throughout the years. We would love to hear from some of the people that knew my dad and our family. We can be reached by e-mail at simmybon@aol.com . Once we left the Buffalo area in 1973, my dad served congregations in Elmira and Utica, New York; Erie, Pennsylvania; and Wilmington, Delaware. He was a member and honorary fellow of the Cantors' Assembly, which recognized him as one of the most distinguished cantors in America. Cantor Markowitz participated in numerous cantorial concerts throughout the country, and was widely praised for his improvisational abilities. He also appeared on television shows where he performed cantorial, Yiddish and secular songs. An outstanding lyric tenor, Cantor Markowitz was admired for his extensive knowledge and appreciation of cantorial music and nusach. He was deeply loved for his dedication to Judaism, boundless joy and genuine kindness. Cantor Markowitz passed away in September, 1992 in Wilmington, Delaware at the age of 67. His voice still resonates in the hearts of his wife, Faye; sons, Harvey, Bruce, Stuart, Joel, David and Saul; and his many grandchildren.